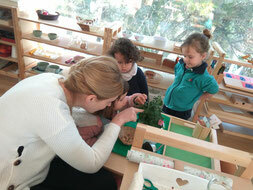 At Montessori Córdoba learning is an exciting process of discovery. 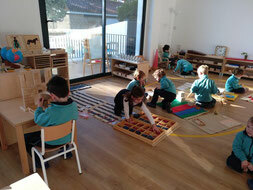 The children in our classes learn at their own pace according to their own choice of selected activities. Children enjoy 3-4.5 hour work cycles during which they investigate, research and manage their own learning with the support of trained Montessori guides who facilitate the child’s interaction with the learning environment and the International Montessori Curriculum. Montessori students develop concentration, motivation, health, self-discipline, and a love of learning. Our school environment prioritises the well-being and best interests of our students. An education at Montessori Córdoba is an education for life; preparing our students for success and happiness in the 21st Century. We are committed Montessorians who firmly believe that the philosophy and method developed by Maria Montessori a hundred years ago combines all the features of a coherent and relevant education for children today. We know that the Montessori methodology prepares children to lead a successful and happy life. We combine hands-on, active learning materials: independent and individualised learning with a tried and tested international curriculum and dedicated, trained guides. Children learn many skills which will help them to succeed in life. For children to become truly bilingual in Spanish and English, the best method is to experience full inmersion at Montessori Córdoba in their second language in the Early Childhood Environment (0-6 years old) and then move to a bilingual sytem; 70% English and 30% Spanish, in Elementary (6-12 years old).